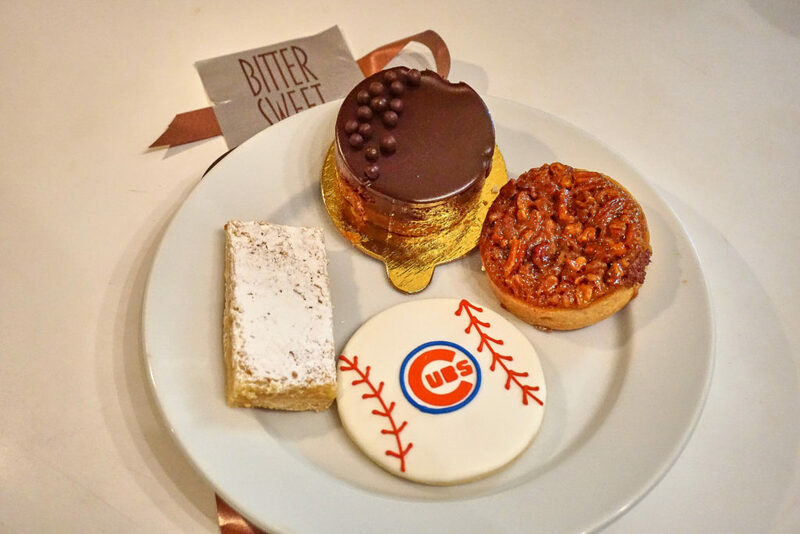 Mindy Gohr knew from childhood that she wanted to be a pastry chef. 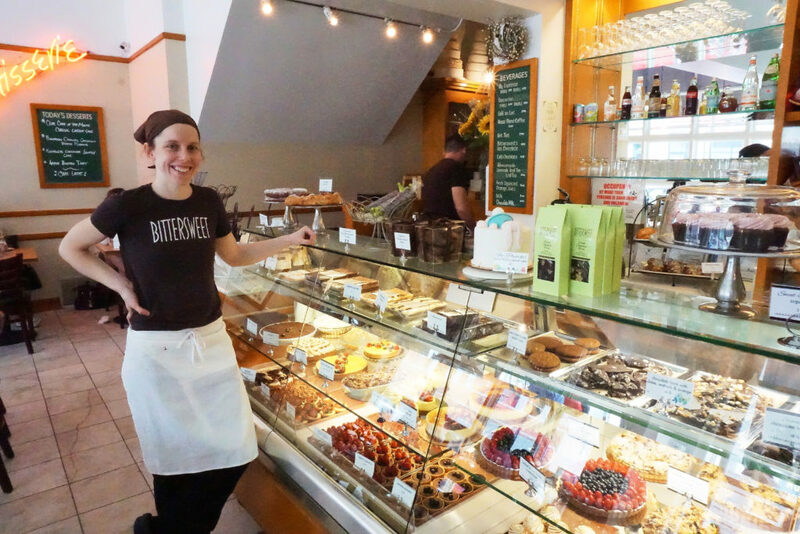 She left her family’s dairy farm in Wisconsin after high school to attend the Cordon Bleu culinary school in Chicago, and it did not take long for her to get the big break that has been her career-maker: an internship working at Bittersweet Pastry Shop & Café for founder-owner Judy Contino, one of Chicago’s leading pastry chefs. 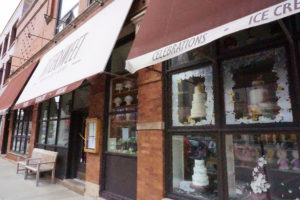 Within eight months, Mindy was full-time as lead cake decorator at Bittersweet, located about four miles from downtown in the Lakeview neighborhood. Before long she was promoted to lead pastry chef. And in 2015, when Contino decided to move into semi-retirement, Mindy became co-owner with Esther Griego — Contino’s niece — who runs the business operations. In the following excerpted q-and-a, Mindy describes the heady experience of running one of Chicago’s legendary food businesses while still in her early 30s. 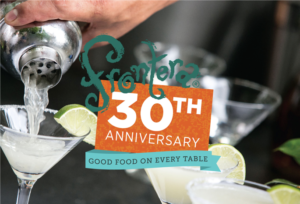 She also will be participating in the Frontera 30th Anniversary Celebration, a joint fundraiser for Chef Rick Bayless‘ Frontera Farmer Foundation and FamilyFarmed, which will be held at The Art Institute of Chicago on Sunday, April 30. To learn more about the Celebration and to buy tickets, please click here. Family Farmed: Was baking always a passion for you? Mindy: It was. I remember sitting next to my mom in the kitchen. My mom was the birthday cake baker for me and my brothers and our cousins. I would sit next to her and I’d watch her and she would squeeze the pastry bag full of frosting into my mouth. Family Farmed: It’s a big step up from being a great home baker to being a culinary school graduate. How was that adjustment? Mindy: Sometimes I like to tell people it’s better to keep it as a hobby. You lose some of the joy. But ultimately it’s the same thing. The biggest difference is you’re doing it over and over and over again and you’re dealing with quality control and making sure, everything’s got to be the same every time. When you’re at home, you can do it one way this week, one way the next week. It’s about making sure you’re getting consistent product. One of the biggest things for me now is overseeing the whole staff in the kitchen. There’s 20 other people baking things too, making sure those people are doing it the right way too. It’s not just, I’m a professional baker, I work for myself. I’m a pastry chef, working in the kitchen and monitoring the quality and the quality control, but to a much larger scale. Family Farmed: As for your kitchen staff, how many of them are culinarily trained? Mindy: Percentage-wise, I think maybe a fifth have a culinary degree. The majority are trained on the job. I think whether you have a culinary degree or not, you’re going to learn whatever you need to know while you are working, and you need to go in humble and know that even though you did it this way in school or your last job, there’s going to be a way that the baker or pastry chef wants you to do it. So getting the staff that’s hard-working, that’s passionate about working hard and training them to do what you need to do is sometimes better than having someone who has a culinary education. Family Farmed: You interned for Judy Contino, and that wouldn’t have happened, I don’t think, if your talent was not recognized in culinary school. Family Farmed: Given that pretty quick progression, you had to have a sense at a very early age that you had what it takes. Mindy: For me, it’s always been natural, it’s what I do. I don’t see myself excelling or being a better or anything. It’s what I do. I work hard because I think people should work hard. My dad’s a dairy farmer outside of Green Bay… When you grow up with that work ethic, it’s what I know. It’s how I work. I try to get people who have that same ethic in the kitchen. 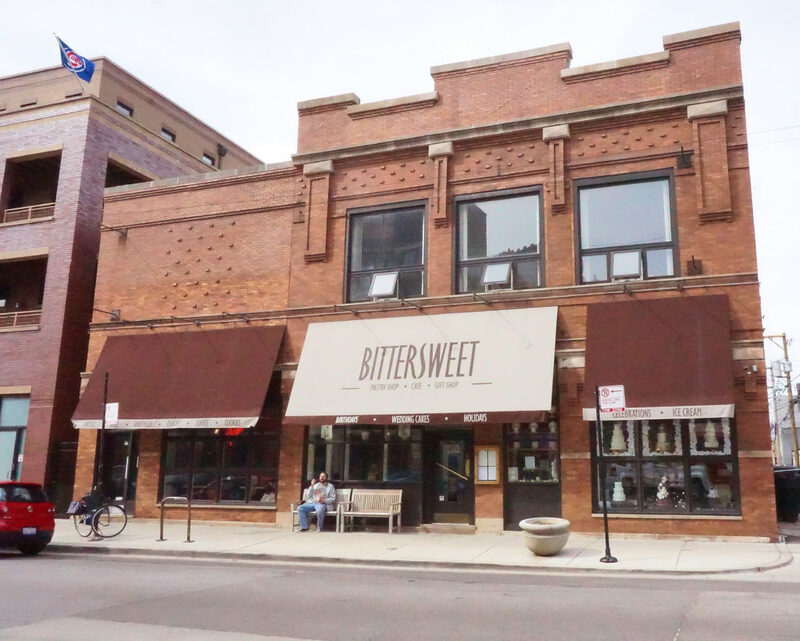 Family Farmed: Judy has said that when Bittersweet started, it was the game in Chicago baking, and then other shops were doing that kind of thing, and it was time for a change. What did she mean by that? Mindy: I think what Judy meant by that was she had been at it at that point for 20 years, 22, 23 years, she’s always been the idea woman. The energy to implement those and to be in the kitchen to make sure these things are happening is not where she was at the time. It was about just having some young blood. I speak with Judy every other day. She is still a huge part of what we bring in in terms of product, what we phase out, things like that. It was just about getting new energy. We didn’t want to change the feel of the shop, we didn’t want to change all of the stuff in the case… The idea was to just add in new things and to bring the shop into the 21st century a little bit. We redid the website, the social media aspect is something she wasn’t really in touch with. Family Farmed: Are there any particular items that you’ve added? Mindy: One particular item that I am quite proud of is the cinnamon roll that we do on Saturdays and Sundays. As a child, it was a treat when mom made cinnamon rolls, we’d always have them on Sunday. So I developed a cinnamon roll recipe and now we’re doing it. We sell about 70 or 80 of them a weekend, it’s a pretty good seller. It something that I always wanted to have in the shop way back when. That’s been a really big hit. Also, shrinking down. See that carrot cake cheesecake and vanilla cheesecake, those mini ones. Sort of shrinking down some of our signature items into individual portions, has allowed people to try more. It’s more accessible. Family Farmed: People are changing the way they eat too. If you’ve been working out every day, having a single-serving portion like that is exactly what you want. Family Farmed: Do you do much savory baking as well? Mindy: We have a cheddar scone. But most of our pastries, most of our baked goods are sweet. We do quiches for breakfast and lunch, and with Easter coming up, quiches are a really big seller for Easter brunch. Family Farmed: I’m seeing that bourbon caramel croissant bread pudding on the board. Mindy: That’s a crossover that was beast of necessity. That was a batch of croissants that wasn’t proofed quite correctly. Family Farmed: That’s a huge piece of creativity, to be able to salvage the situation like that. Mindy: I’ve got a lot of ingredients at my fingertips. That’s just another thing between being a professional baker and a home baker. Because if your batch of croissants didn’t turn out right at home, you might not have bourbon, who might not have all of the ingredients. Family Farmed: As for Rick Bayless, what’s your acquaintance with him? Mindy: I remember discovering Rick Bayless as a child watching Mexico One Plate at a Time. I was intrigued by him even then, before I knew I was going to be in the food industry, before I knew I was going to be in Chicago. Watching him so involved and interested and excited about the food he was making, that was really appealing. Family Farmed: So we’re excited about having you prepare dessert for the Frontera 30 event. Do you know what you’re making? Mindy: Yes, they asked for it right away. We’re going to do mini-Pavlovas with Mexican flair, we’ll probably do some sort of coconut-passion fruit. We’ll see where it goes, but something that’s easy to pop. I did the Tao of Tacos [part of the annual Chicago Gourmet event] last fall and we were the only sweet taco, and it was such a revelation for everybody to come savory, savory, savory, savory, savory, and then we had a sweet taco, and it was, “Wow!” We did a sesame tuile with mango butter and mole ganache with candied lime zest and some pepitas on it. Judy helped me come up with that combination. Family Farmed: What does mole ganache taste like? Mindy: Mole has chocolate in it, it has a lot of spices, so it was just a little sweeter. I’m looking to recreate that experience for the people who come to the party. Pop it in and say like, “Wow!” That was refreshing bite of sweet flavor. Family Farmed: I’ll have to make sure to make room! This entry was posted in Baking, Food Artisans, Food Entrepreneurs, Frontera 30th Anniversary Celebration, Frontera Farmer Foundation, Good Food business development, Good Food restaurant trends, Good Food Success Stories, Restaurants and Good Food and tagged Bittersweet Pastry Shop & Cafe Chicago, Chef Rick Bayless, Chicago Gourmet, Cordon Bleu Chicago, FamilyFarmed, Frontera 30th Anniversary Celebration, Frontera Farmer Foundation, Frontera Grill, Judy Contino, Mexico One Plate at a Time, Mindy Gohr, Mindy Segal, Mindy's Hot Chocolate. Bookmark the permalink.